Numerous was to play when playing these different trucks. Prefect for Practice Solo Construction Skills or Share with Friends and Family. ✔️11 IN 1: 11 sets of construction vehicles included carrier truck, helicopter, excavators, dumper, bulldozer, forklift, tank truck, asphalt car and drilling car on one Carrier Truck. 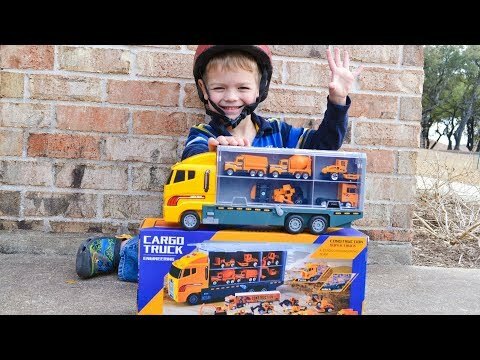 ✔️EDUCATIONAL PLAY: Toy truck help your kids boost hand and eye coordination. A great educational gift for birthday gift, Christmas gift, school prizes, party favors to develop the ability of mindset and exploration. ✔️PLAY FOR HOURS: Each Construction Truck is in Unique Design and Perfectly Fit in Kids’ Hands and Pockets. With only some Sand, Your Children can Create Their Own Construction Base. ✔️HIGH QUALITY: Conforms to US Toy Standards. Made of Toxin Free Materials, Safety Always Comes First.